When you get a new computer, still have music you love on your iPhone and your iTunes library is empty, you will want to transfer music from iPhone to iTunes. Besides, out of safety and backup, you will still choose to copy music from iPhone to iTunes. More importantly, you need to know how to transfer music from iPhone to iTunes. You may ask "How can I transfer music from iPhone to iTunes". Therefore, let me explain three ways to move music from iPhone to iTunes in detail. For the music you love, you want to backup lest you lost them. So you can copy iPhone music to iTunes with iTunes. Here are the steps of transferring iPhone music to iTunes with iTunes. But this only works for the purchased songs. You can follow these steps to move iPhone music to iTunes. 1. Open iTunes and then connect your iPhone to computer. 2. After your iPhone is connected to the computer, iTunes will automatically detect your iPhone. Then, click "Files>Devices>Transfer Purchases from iPhone" and the iPhone music you purchase will be added to iTunes library. 3. At last, you can enjoy listening to your music on iTunes. It would be extremely easy for you to transfer music from iPhone to iTunes with the help of iTunes itself. However, you should remember that iTunes only helps you transfer purchased music from iPhone to iTunes music library. Actually, for purchased music, you could redownload them from iTunes music library on your computer as well. Leawo iTransfer is the easy-to-use iPod/iPad/iPhone transfer software, which provides convenience for users to transfer files among iOS devices, iTunes and PCs. Leawo iTransfer has an outstanding performance in providing perfect solution for iPhone transfer. Here are the steps of how to copy music from iPhone to iTunes with Leawo iTransfer. Download and install this icopy on your computer. Here are the steps of how to copy music from iPhone to iTunes with Leawo iTransfer. Download and install Leawo iTransfer on your computer. Connect your iPhone to your computer with USB cable and open Leawo iTransfer. Click the name of your iPhone and choose "Music" on the left column. Then the music in your iPhone will be showed on the right part. Select the music you want to transfer on the right column. Or you can hold Ctrl/Shift key to select some music. Right click the music you want to move and click "Transfer to". Next, choose "iTunes". Or you can also click the transfer button at the bottom of the window. After you click the transfer button, a dialogue box will appear. Check "Transfer to List" in the popped up window and then choose "Transfer Now". The transferring starts. Then you can see all the selected music on iTunes. 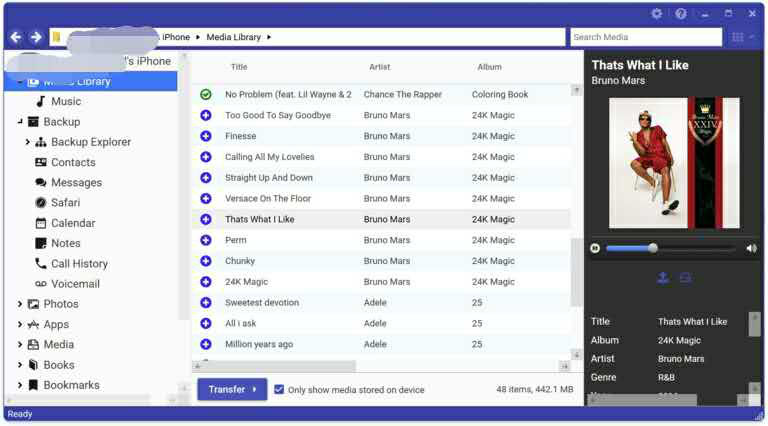 With Leawo iTransfer, you could copy multiple data and files like music, video, photos, etc. between iOS devices, iTunes and computer. If you’re using a Mac computer, you could make use of Leawo iTransfer for Mac. iExplorer is the application that allows you to use iPhone or iPad like a flash drive and to navigate files and folders that you have stored. With iExplorer, you can transfer music, messages, photos, medias, files and everything else from any iPhone, iPod, iPad or iTunes backup to your computer. The following guide will show you how to get music from iPhone to iTunes. 1. Connect your iPhone with its USB cable to computer and open iExplorer. 2. 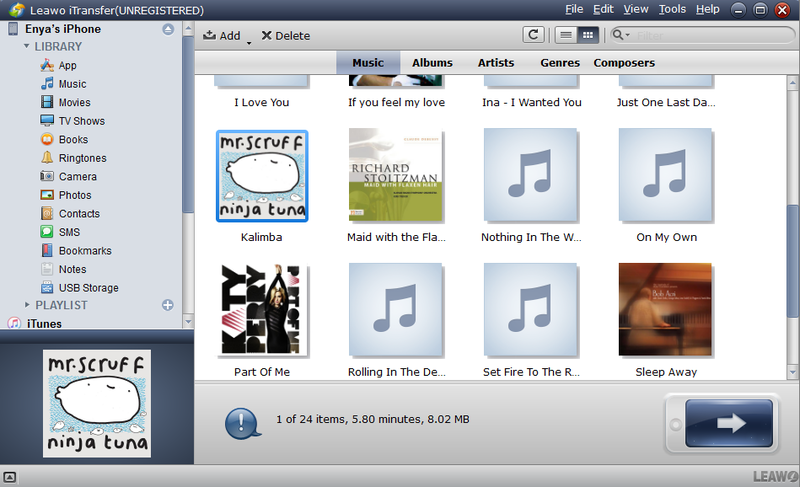 After you open it, you can click "Music" or "Media Library" on the left column. 3. 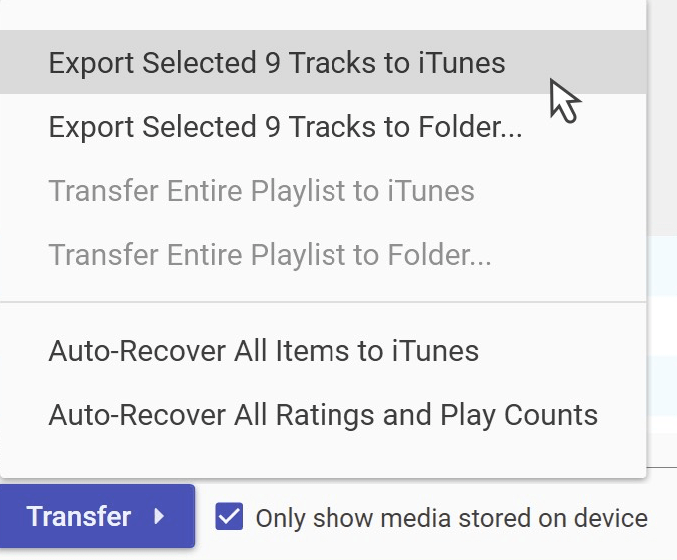 Once your Media Library has loaded, click the songs you want to transfer to iTunes. When you select a song, you can click it once. If you want to select multiple songs or an entire album, you can hold the Ctrl key and click the music you want to move. 4. Then, click the transfer button at the bottom part. You will see several options on the popped window. Click "Export Selected Tracks to iTunes. This will export your songs to your iTunes. 5. Finally, all the songs you transferred will be displayed on iTunes. The above mentioned 3 ways to copy music from iPhone to iTunes are all very useful. Certainly, there are differences among the three ways. Let’s see the differences one by one. iTunes runs slowly and when you open it, you will find that CPU usage will up to 50%. In addition, if you have two computers, you can’t sync all the music files to iTunes. You can just sync the files of one computer to iTunes. As for iExplorer, it can easily make you transfer music to iTunes and computer. But it will take up a lot of space on your computer. 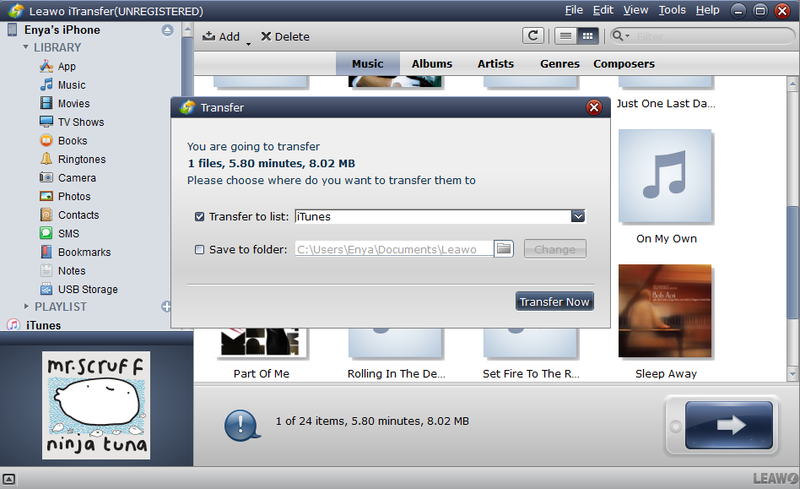 However, with Leawo iTransfer, you can transfer iPhone music to iTunes whether you purchase it or not. Furthermore, it takes up small space. Obviously, Leawo iTransfer is the best choice when you want to transfer music from iDevice to iTunes.